THE ECCLESIASTICAL AND COMMUNAL councils and the villagers of Yimrihane Kristos is our closest collaborators and those who we in SCECH firstly listen to and by our professional capacity wants to assist. They are the owners and responsible for the management of the this heritage site and its artistic belongings and they have from generation to generation ever since the establishment of this site had the authority over this place and its future. In the image above we see the Head priest Abba Welde Qirqos with a cross in his hand, flanked by Professor Karl Gunnar Olsson, SCECH’s building expert and the Head of the communal council as well as a guard belonging to the society of YK. The site of Yimrihane Kristos has ever since the beginning, presumable in the first half of the 12th century, been a holy place and a site of pilgrimage and is today in the same time one of the greatest cultural heritage sites in Ethiopia. Here are art and piety deeply interlaced in a beautiful way. The spirit of the hearts of the inhabitants here and the spirit of the place – genius loci – with all what physically belongs to this one lives in symbiosis. How this peaceful place for prayer and devotion stands in relation to the wish of making this to a world heritage site, with crowds of tourists coming from all over the world, is one of the key issues to be discussed with the members in these councils and the people of YK before, during and after in the planned Pilot project of conservation here. To quote Helena Nikkanen, appointed to be the Chief Restorer, apropos this matter of tense at sites of prayer and pilgrimage which in the same time are tourist attractions, it has to be understood that they are churches and remain churches – not museums or exhibitions. And to continue quoting from the abstract of the doctor’s thesis of our expert in SCECH within this field, Professor Inger Lise Syversen, we have to increase understanding of the relationship between policy documents and their impact on architectural heritage management, so as to help build a platform of understanding that will bridge the gap between the local community and international policy level. 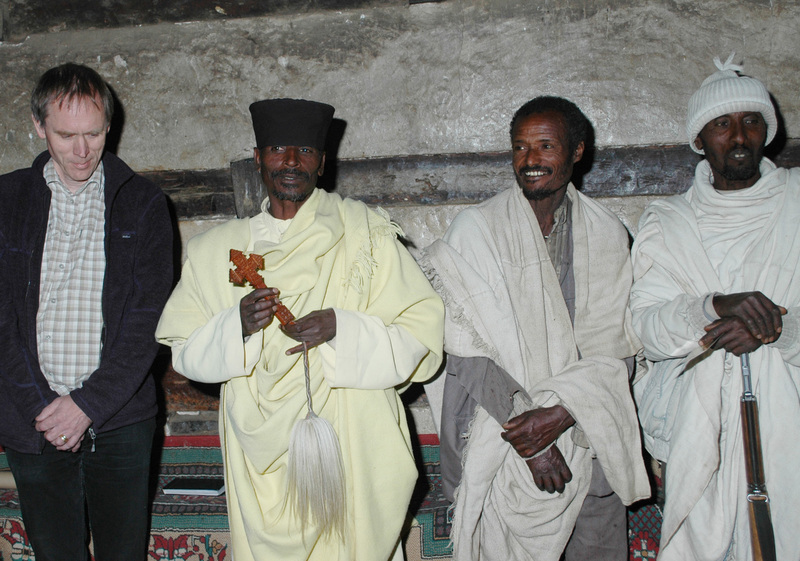 To find a balanced solution between the objective to keep the site as a peaceful place a priori established for worship and devotion and the wish from the people of Yimrihane Kristos as well as from national stakeholders to develop it as tourist goal for visitors from Ethiopia and internationally, which will increase the economy for this society as well as nationally is a great challenge. In line with our over all objectives expressed in our charter and especially our goal to promote deeper knowledge and responsible tourism, it is our wish in SCECH to contribute to the discussion about these crucial issues for the YK site with the ecclesiastical as well as communal councils. 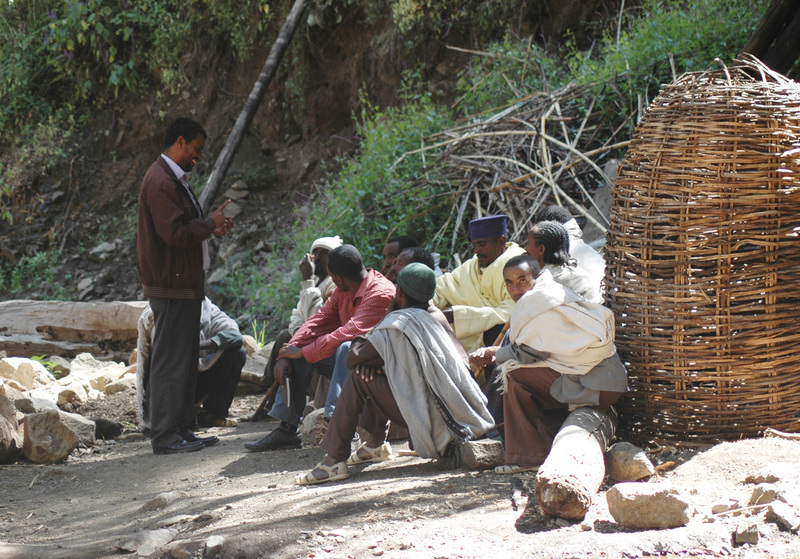 In this image we see our contact person in YK, Ato Mengistu Gobezei, a son of the village and an Orthodox priest, MA archeologist and a very close friend to SCECH informing some of the villagers about our ongoing examination right outside the church compound. The SCECH’s conservation team became during these days of examination of the buildings and paintings of this site 2012 friends with the local people and the priests and are warmly welcome to return and to implement the conservation. Some of us have also in connection to the great workshop held in Addis Ababa 2013 and dedicated to the issue of deterioration and conservation of the Ethiopian cultural heritage with starting point in the site of Yimrihane Kristos and during the consultative meeting in Lalibela in May 2015 continued to develop this friendship. In August and September this year at least one of our friends in Yimrihane Kristos, the reverend, Abba Welde Qirqos, is going to visit us here in Sweden. Together with a delegation of five key figures of the local group in Lasta they will come in order to learn from ongoing projects of conservation here and to discuss with us details in a plan for the Yimrihana Kristos Pilot project, as well as the future of this site after finalized conservation.